A SCCM PXE-Handshake with architecture detection uses an additional step. Before sending the final bootstrap file, the SCCM server sends out a bootstrap file which has an included architecture detection. The file is called „wdsnbp.com“. This is necessary, because the architecture information provided by the smbios is not very reliable. The wdsnbp bootstrap file sends back a DHCP request reply which contains an additional DHCP option 250. This high option is normally not used by other tools and contains information concerning the architecture of the client system. Right after the first contact of the client, die SCCM server checks for the necessary bootfiles. If the bootfiles are not present in the boot-directory (normally Remoteinstall\SMSboot), the server will not send out a DHCP offer. Since the bootfiles are extracted of the WinPE wim files during the startup of the WDS service, you should make sure, that only WinPE WIM files are stored within the SMSPXEIMAGES$ share and not full-os WIM files. Secondarily the SCCM server checks whether the client exists within the SCCM database. 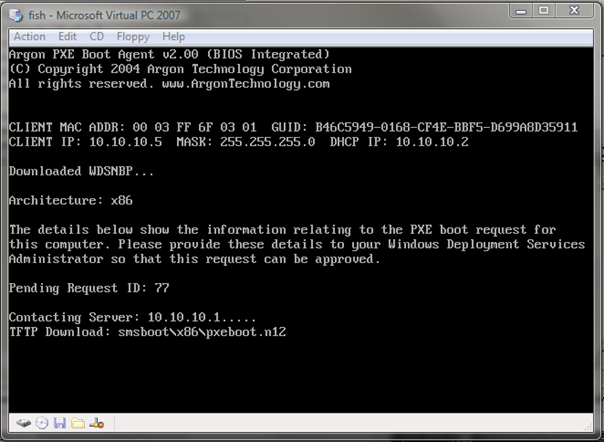 If the client is unknown, the SCCM server will not send out a DHCP offer.